Heat oven to 350°F. If necessary, cut thin slice off bottom of each bell pepper so peppers stand upright. In medium bowl, mix polenta pieces, corn, and half of each of the cheeses. Salt and pepper to taste. 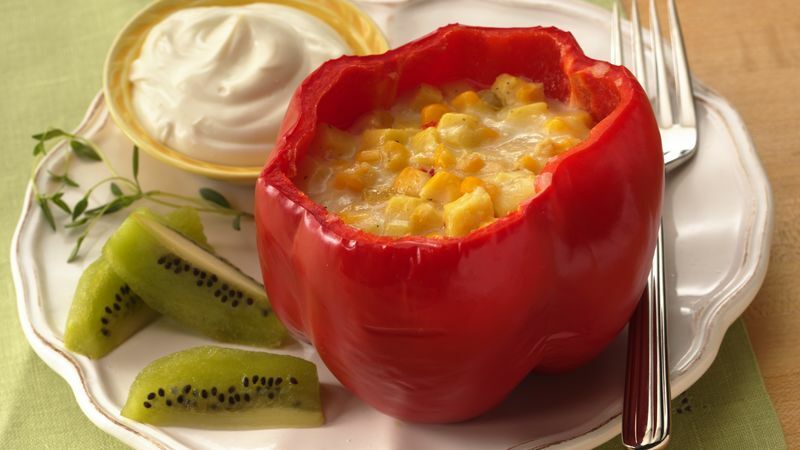 Spoon polenta mixture into bell peppers; sprinkle with remaining cheese. Place filled peppers in ungreased 8-inch square (2-quart) glass baking dish. Fill dish halfway with water. Spray 12-inch square piece of foil with cooking spray; cover dish tightly. Carefully place dish in oven. Bake at 350°F. for 30 minutes. Remove foil; bake an additional 15 to 20 minutes or until bell peppers are crisp-tender and filling is thoroughly heated. Cool 5 minutes. Carefully remove bell peppers from dish. Garnish each with sour cream.